We are grateful to Alfredo Carias for permission to reproduce this article here. 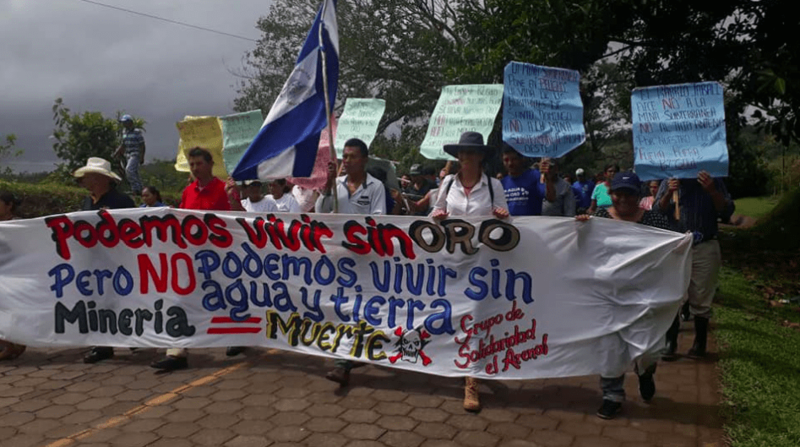 In the midst of the socio-political crisis which hit Nicaragua in 2018, the mining company Cóndor Gold took advantage of its influence and various legal spaces to obtain an environmental authorisation to continue exploiting the natural resources of the Santa Cruz de La India community. The people of the Mina La India community did not recognise the dubious public hearing process carried out by Cóndor Gold which it claims validates the opening of an opencast cleft of approximately 600 meters in the zone. This would put the security of the families who live in the area at risk. “Once again the people of Santa Cruz de La India are not giving in and are not selling themselves. So we say: Get out Cóndor Gold; our awareness is stronger than your false promises”, explained Olmán Varela, a representative of the National Environmentalist Movement Against Industrial Mining (MONAFMI). Despite the community’s rejection of the mining project, the company has received the environmental permit from the Nicaraguan authorities for the construction and operation of a processing plant that will have the capacity of 2,800 tonnes a day, an authorisation not considered transparent by the community. Heizel Torres, a mining expert of the Centro Humboldt, complained that the government of Nicaragua modified the environmental regulations to the benefit of the mining companies by eliminating the environmental impact studies, as was evident in the Mina La India case. This arbitrary act by the government violates due process which should be the right of a community – the right to establish a free, prior and informed consultation seeking the consent or not of the community before the start of an extractive project which may affect health and ecosystems in the area. As a consequence, the population of Santa Cruz de La India rejected the approval of the environmental authorisation granted to the Cóndor Gold mining company and in a public statement demanded the immediate departure of the company from the community. The resistence of the Mina La India community dates from 2015, when the company entered the area and provoked a social conflict between the people and the company, leading to confrontations with peaceful protests and huge marches and even the persecution and criminalisation of environmental defenders by local authorities acting under the company’s orders. The social and environmental conflict rose to an international level due to MONAFMI’s complaint to the Inter-American Commission for Human Rights (CIDH), in which it was revealed that they had suffered threats and harassments for defending their communities. Their statement was made due to the lack of an internal resolution to the problem on the part of the Nicaraguan state.